Often we need to add new repository on Deb based OS like Debian or Ubuntu from SSH. An example situation can be while installing OpenPanel on Debian or Ubuntu. 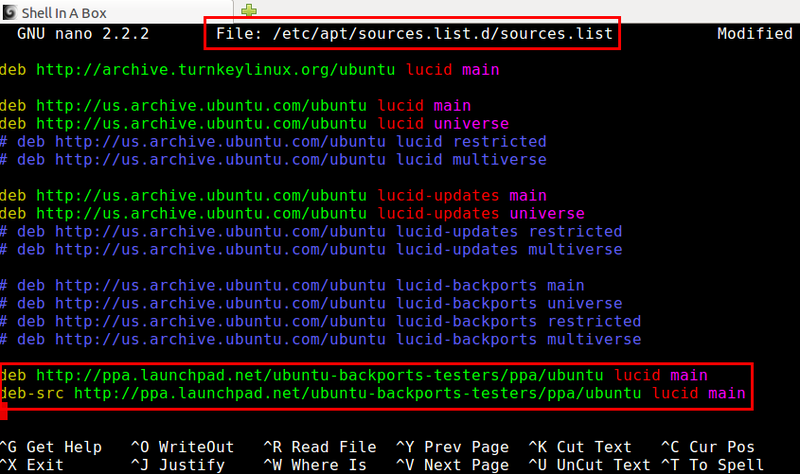 Here is the guide to show you how to append new source of software to sources.list without opening the File in nano or vi command line editor in simple steps. Actually this manual method to edit the sources.list file is slower and its difficult to avoid errors. sudo sh -c "echo 'deb http://ppa.launchpad.net/person/ppa/ubuntu karmic main' >> /etc/apt/sources.list"
sudo apt-key adv --recv-keys --keyserver keyserver.ubuntu.com 886DDD89 # Now you can add the repository in /etc/apt/sources.list.d/ with add-apt-repository: sudo add-apt-repository "deb http://deb.torproject.org/torproject.org $(lsb_release -s -c) main"
sudo add-apt-repository "deb http://deb.torproject.org/torproject.org $(lsb_release -s -c) main"
We do not recommend to use /etc/apt/sources.list for third-party repos, use /etc/apt/sources.list.d/ instead. This Article Has Been Shared 8502 Times! Create Bootable Ubunbu Live USB is easily in Mac and Windows if you use a tool named UNetbootin.This is important for using Ubuntu for Private Cloud bare metal. Cite this article as: Abhishek Ghosh, "Append New Source to sources.list Without Opening the File," in The Customize Windows, June 4, 2014, April 19, 2019, https://thecustomizewindows.com/2014/06/append-new-source-sources-list-without-opening-file/.